A couple of weeks back, we thought we had the artwork to Kanye West's upcoming album Yeezus thanks to a tweet from the rapper's girlfriend, Kim Kardashian. Evidently, the final art may even be simpler than that. As you can see above, it's reported to be just a clear CD case with a simple red sticker bearing the title. In other words, it looks fairly similar to the previous art but without the melted gold. The tracklist is apparently on the back. This new art comes from BBC Radio's DJ Semtex, who revealed, "No cover, booklet, just a sticker on the reverse of the package with the track list." His website is currently down due to the massive flood of traffic, but he wrote on Twitter that this is "The official artwork/packaging." UPDATE: A Def Jam rep has confirmed to Pitchfork that this is indeed the album artwork. Also on Kanye's website you can also hear a sample of a new song apparently called "Bound." The promotional image that he posted includes the note "please add graffiti," implying that fans should personalize the packaging with their own handiwork. 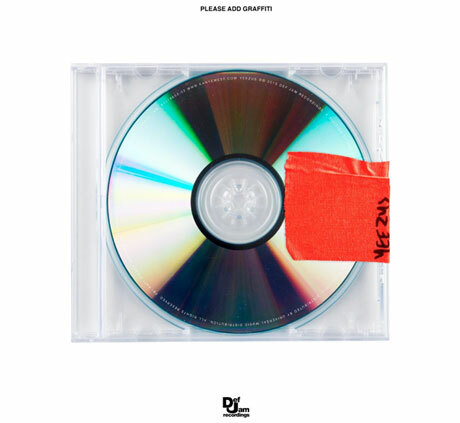 However, we're a bit lost on how this is all going to work if Yeezus is to come out on vinyl. Yeezus is scheduled to arrive on June 18, and will presumably include the new songs "Black Skinhead" and "New Slaves."